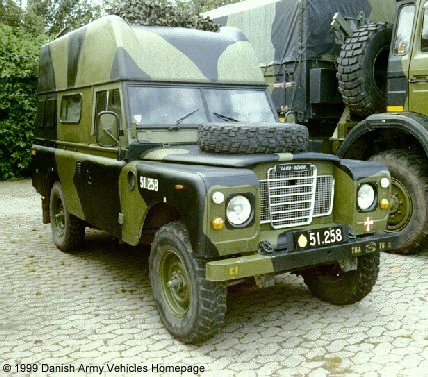 Danish Army Specific: The Landrover 109 shown is fitted with a Sylvania Automatic Telephone Exchange. Historical: The shown series III model was introduced in October 1971. Most important changes was a all-new synchromesh gearbox, and a 9½ inch clutch formerly fitted to only the diesel and 6-cylinder models became standard across the range. Stronger half shafts were also introduced to the long wheelbase model. A new brake system was fitted with revised brake drums, re-routed brake pipes and a translucent brake fluid reservoir. to ease inspection. External the recognition point for the new model was the new silver grey ABS radiator grille replacing the galvanised wire mesh of earlier models. A circular heater inlet appeared on the nearside wing just ahead of the front door. A "High Capacity" version with a GVW of 3.020 kg was introduced in march 1982. Made in many variants like anti-tank, missile carrier and ambulance by outside contractors. Even halftrack- and 6 x 6 versions have been made. Length: 4.56 m (177 inches). Width: 1.63 m (63 inches). Height: 2.41 m (94 inches). Weight: 2.700 kg (5.940 lb.). Horsepower: 59 at 4.000 rpm. with preparation: 0.7 m (27 inches). Fuel capacity: 90 liter (20 gallons). Additional: Eberspächer heater type D4L in shelter.